What does Gov. Abbott think of Donald Trump's controversial comments? For the last few weeks, much of the energy in the GOP presidential primary has been spent running against or away from Donald Trump's remarks on Mexican immigrants. At the Texas capitol, it's quiet on the topic, and our attempts to find out what the governor thinks were not successful. This is the story of how a story remains untold. In case you haven't heard, in his presidential announcement on June 16, Trump said, "When Mexico sends its people, they're not sending their best. They're not sending you. They're not sending you. They're sending people that have lots of problems, and they're bringing those problems with us. They're bringing drugs. They're bringing crime. They're rapists. And some, I assume, are good people"
Since then several politicians on both sides of the aisle have denounced it. Texas Governor Greg Abbott has stayed silent. As Governor of Texas, Abbott is faced with the blessings and curses of immigration on a daily basis. An expensive and expansive border security plan was a cornerstone of the recently completed legislative session. Abbott is married to a first generation American. His mother-in-law is a Mexican immigrant and featured prominently in his 2014 campaign. Abbott is also the recipient of $35,000 in campaign donations from Donald Trump. 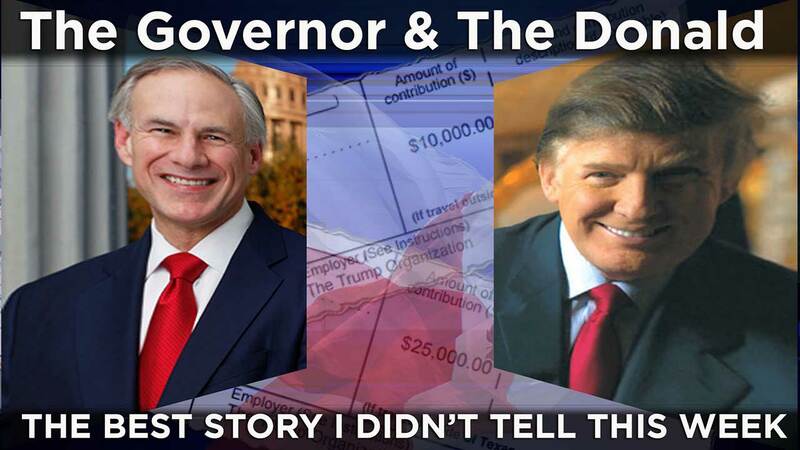 On July 29, 2013 Trump gave Texans for Greg Abbott $25,000, Trump gave another $10,000 on May 2, 2014. On both donations, Trump is listed as president of The Trump Organization. I am curious what Governor Abbott thinks of Donald Trump's comments about Mexican migration into this country. Certainly the Governor is in a unique position personally on this issue and politically as Governor of Texas this issue is front and center for him. Ethics commission records also show he's received $35,000 from Donald Trump (7/29/13 & 5/2/2014). I would love to hear his thoughts on Trump's comments, but also want to know if he has contemplated giving the $35,000 back to Trump. Border security continues to be at the forefront of Governor Abbott's agenda. Because the federal government has failed to take action, Texas has stepped up and Governor Abbott just signed into law the toughest border security plan in the nation. Governor Abbott looks forward to hosting Secretary Meade Kuribrea this evening and discussing this issue as well as how the state can strengthen the cultural and economic bond with Mexico." This was the extent of the response. There was nothing on Trump, let alone the Trump donations. A request for clarification was not returned. While we were not at the brief press availability before the Austin dinner last night, press accounts of the dinner do not mention it and his office says it did not come up. In remarks to The Texas Tribune before the dinner, Secretary Meade Kuribrea said about Trump, "When in politics, any time that you bring prejudice, racism and just plain ignorance, it's not a good mix." Rice University political science professor and frequent commenter on Texas politics, Mark Jones, tells ABC13, "For Abbott there is no upside to wading into this debate. If he denounces Trump's negative comments about Latino immigrants, he offends many Texas GOP primary voters, but if he in whole or in part voices support for Trump's position, he offends many of the same Texas Hispanics whose vote he worked so hard to win last fall. As is the case with global thermonuclear war, Abbott knows that in this instance the only winning move is not to play." Jones also points out the unlike former Texas Governor Rick Perry and current Texas Senator Ted Cruz, neither are running for President. "Does not have the same political need to take part in this debate, his strategy is to avoid the topic and hope it goes away, which it almost certainly will at some point, although there is a risk for the GOP that Trump doubles down on his anti-immigrant position in a visible way and thus forces more and more Republicans to address it instead of avoiding it," Abbott said. "The trick will be effectively avoiding queries from the media and others on his position vis--vis Trumps very negative comments about Latino immigrants until such time that the issue gradually fades from view." We await the governor's response.